Prime Minister Adel Abdul Mehdi on Monday expressed Iraq's desire to expand cooperation relations in the economic and investment fields and develop oil and gas fields with Russia. "Prime Minister Adel Abdul-Mahdi received today the Special Envoy of the Russian President to the Middle East, the African countries and the Deputy Foreign Minister of Russia and his accompanying delegation Bogdanov, who conveyed the greetings of the Russian President and the Prime Minister of Russia," a statement from his media office said. To the sovereignty and renewal of the support of the Russian leadership of the Iraqi government and the desire to develop relations between the two countries in all fields. " "He expressed his pride in the relations between the two countries and the two peoples, and thanked Russia's support for Iraq," stressing that "Iraq's keenness to expand relations of cooperation in the economic and investment and development of oil and gas fields." He praised the "Russian role and balanced relations that contribute to strengthening security and stability efforts in the region." 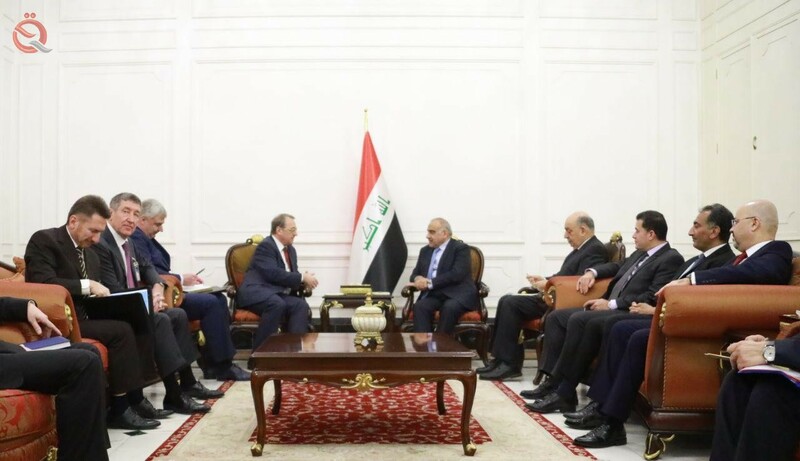 "The meeting also discussed the holding of the next session of the joint Iraqi-Russian government committee and the developments in the region," the statement said. "The meeting was attended by the Vice President of the Middle East and North Africa Department of the Ministry of Foreign Affairs, Yixi Solomatyn, the President of the Union of Russian Oil and Gas Producers Yuri Shafranik, the Director General of Soyuz Naft Gas, Ghazi Gochitel, the Russian Ambassador to Iraq Maxime Maksimov, Iraqi Oil Minister Thamer Ghadhban, Undersecretary of Foreign Minister Nizar al-Khairallah, Iraqi Ambassador in Moscow Haider al-Athari, and a number of advisers. "